The landform along the ocean or sea is called a beach. The edge of the river or lake can also term as the beach. There are many biological things that we find outside the sea like loose particles, rock such as sand, gravel, shingle, pebbles and coralline algae. There are basically two kinds of beaches developed and underdeveloped beaches. The developed one are those which have man-made infrastructure like lifeguard posts, changing rooms, and showers. The underdeveloped or undiscovered one are those which are not developed in this manner. Along with developed beaches, underdeveloped or undiscovered beaches there are many unusual beaches on our planet Earth. So, here we are listing 10 most unusual beaches all around the world. The Beach is located in California. It is one of the most unique or unusual beaches around the world. There are basically two reasons first is that nature has made it in that way and the second reason is that people dumped all the waste here so after some time it became a waste dumping zone. The beach is a part the MacKerricher State Park and is open to the public, however, in the early half of the 1900s, It was known as ‘The Dumps’. Later after years of chemical and natural erosion of the dump converted into smooth, eroded sea glass. This is a great lesson taught by Nature to the humans. You must also know about best beach cities in the world. How to reach: You need to take turn west from Highway 1 on Elm Street and take a drive to few blocks to Glass Beach Drive. Now, park your vehicle at the intersection and walk down to the beach. Swim: The entrance just lies around the corner, so you can take an easy swim (200m), However, swimming is only recommended only if the conditions are right and you are a good swimmer. Also, you should stay away from the cliffs because string wave can easily push you into the rocks. Boat: The local companies offer many boat trips and it usually takes around an hour that will cost you around 20 euro. Kayak: This option can only be available if the sea is calm, however, sea authorities don’t allow you to rent kayaks to reach this cave. The beach is located between ahala and Naalehu on the Big Island of Hawaii. A unique feature of the beach is that it has black sand which is made up of basalt. Basalt is basically a material created by the lava flowing into the ocean. It explodes when it reaches the ocean and after some time, it cools down. The unusual beach is quite famous to see endangered Hawksbill turtles and green turtles taking sunbath across the shore. It is one of the easily accessible black sand beach on the Big Island. You can enjoy different water activities like quick swim, snorkel and camping, however, for camping and picnic, you need to take permission from authorities. The place is surrounded by palms trees and you can enjoy the shade of the trees because black sand can get very hot in the sunlight. Also, read Top 10 Best Beaches in Mexico. It is located in New Zealand. The beach has a 58 million years old dragon eggs on the shore as you can see in the picture. The beach is quite famous for its incredible natural boulders and there are 50 boulders along Koekohe Beach. The biggest is of 7 tons and measures over 2 meters. It took over 4 million years to form the largest boulders, however, the tiny fragments began forming 60 million year ago. The Moeraki Boulders are legally protected by the government. How to reach: The boulders are located between the towns of Moerkai and Hampden. Take a drive on State Highway 1 from the north or south. You can see boulders after 30 minutes drive (40 km) to the south of Oamuru. The beach is on the way Papakolea Beach on the island of Hawaii. The sand of the beach is of green color. It is because of the mineral olivine. According to Wikipedia, there are four green sand beaches in the world namely, Talofofo Beach on Guam, Punta Cormorant on Floreana Island in the Galapagos Islands, Hornindalsvatnet in Norway and Papakolea beach on the Big Island of Hawaii. The beach is located in Iceland. The sand of the beach is black due to volcanic lava explodes as it comes in contact with the sea and after some time, it cools down. This process makes the whole sand along the beach black. The most unique and attractive feature is that the ice chunks are placed at regular intervals on the beach. 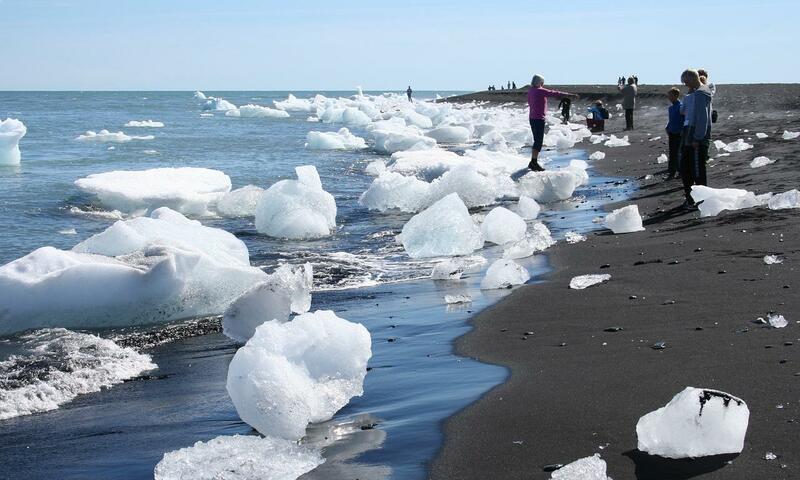 This combination of black sand and ice chunks make it very attractive in its own way. The beach is located in Ireland. The uniqueness of the beach is interlocking basalt columns. It is a result of volcanic eruptions millions of years ago. The beach is a combination of closely packed hexagonal basalt that are approximately 40,000 in numbers. It has been formed due to intense volcanic activity and lies on the north coast of the county of the Antrim, Northern Island. The symmetrical and unique rock formations is quite famous among travelers. In 1986, it has been listed as a world heritage site. How to reach: Please take a train route on the Belfast/Londonderry line to Coleraine or Portrush. Now, take a bus to the visitor center. The Beach is located in California. The sand of the Pfeiffer Beach have purple color. It is because of the manganese garnet deposits and also clear quartz. The beach looks very colorful and beautiful. This unique characteristic of the beach makes it one of the most unusual beaches in the world. The beach is the attraction for the people of Maldives and tourist in the night. The beach sparkles in blue colour in the night. If we believe science there is natural phenomenon created bioluminescent phytoplankton called Lingulodinium polyedrum. This material basically sparkles at night. The beach is incredibly beautiful and one of the most unusual beaches in the world. It is also known as Playa De Amor or the Beach of Love. The beach is totally hidden by the caves all around it. The beach was created by the Mexican government during target practice in the early 1900’s. It is also one of its own kinds and also one of the most unusual beaches in the world. The beach is invisible from the outside, however, it can be accessed through a long a water tunnel that automatically links it to the Pacific Ocean. The space beween the water levels is approximately six feet, so you can easily reach it by swimming or kayaking. The island was uninhabited, however, visitors from across the world come here to enjoy the diverse marine wildlife and the unique tropical Eden of Playa del Amor.